Previously, Google AdWords search ads were only subtly labeled by an almost-imperceptible pale yellow background shade and gray text at the very top. (See an example here.) 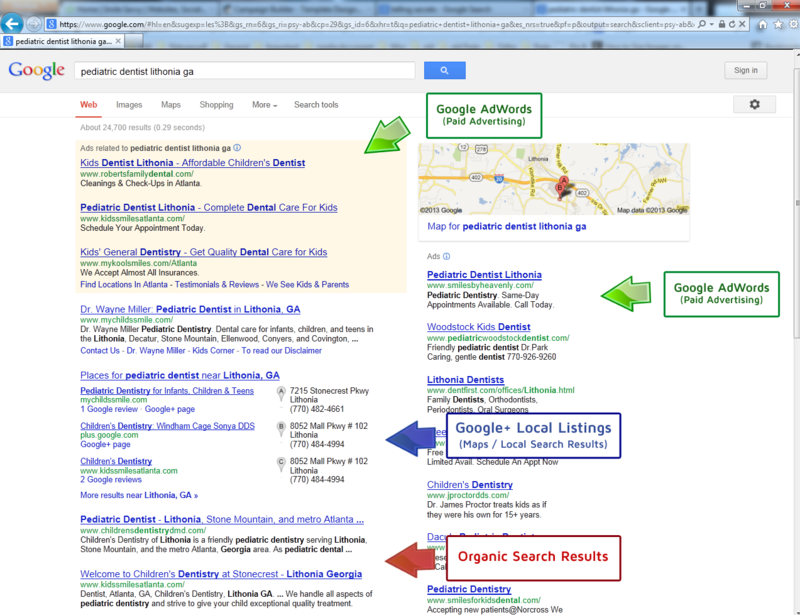 Now, however, the ads are impossible to miss—and, consequently, impossible to mistake for organic search results. What do these “Ad” labels mean to your business? One benefit of advertising with Google via their AdWords program is that you have the potential of reaching the top of search results pages even if organic competition is too stiff for your relevant keywords. Prior to the test Google is currently running (which may or may not be visible to you at the moment), it was fairly easy for searchers to overlook the difference between paid and organic search results, and, as countless studies have shown, people are much more likely to click the highest result on the page (especially if they don’t differentiate between the types). By casting such a bold spotlight on AdWords ads now, it’s quite likely that many advertisers will experience noticeable changes in performance. The question is, will those changes be positive or negative? Some percentage of people will not click on ads, and there’s nothing you can realistically do about those individuals. Even if your click volume decreases because more people notice the top results are ads, don’t immediately adjust tactics just to get the click volume back up again. Take a minute, take a deep breath, and focus (at least initially) on ad and keyword relevance. Improving relevance and targeting is the surest way to improve Click Through Rate. Simply widening your net to catch more searchers is often a recipe for higher costs and lower performance. Even people who click on ads are bound to read your ads more carefully now. Many advertisers use Dynamic Keyword Insertion to automatically place the user’s search query in the ad’s headline, which can be a great strategy. But what happens when people scrutinize ad copy? Does it hold up? Is it addressing your customer’s needs, challenges and desires? Will they see that you understand what they’re looking for, and is there clear direction in the form of a call-to-action? In short, are you telling someone how you will make their lives better, and that they’re just a click or call away from the answer? Like real estate, search advertisers know there are 3 keys to successful web marketing: keyword, keyword, keyword. Even if your product is the best on the market, your website is ideally suited to convert, and your ads are like flowers to bees, it could all fall apart with the wrong keywords. Keywords are the link between people and your business goals. If you sell digital camera batteries, are you targeting the broad keywords “camera” and “batteries” because those high impression counts are so attractive? Chances are your Click Through Rates are pretty lackluster already (not to mention your Conversion Rate), but with these new bold, gold “Ad” labels, those stats will probably dip even further. Take some time to reevaluate your strategy and make sure your target keywords are not too broad (meaning: completely irrelevant searchers will see your advertisements, take a close look at them, realize they aren’t even close to addressing their needs, and move on). That’s not good for anyone involved. Now that I’ve harangued you with dire warnings, let me leave you with a positive reflection. The bottom line is, these new labels Google is testing are good not only for the searchers (transparency), but for advertisers as well. This should force us to examine how our accounts are structured, how closely we monitor ad performance as well as on-site web analytics and results, what keywords and Match Types we are using, and encourage us to test ad variations to find what speaks best to our potential customers. It might take a kick in the pants like bright, eye-catching “Ad” labels beside our paid search ads to get us all to step things up a notch. In the end, that impetus could translate to better ad performance, more leads and sales, happier customers, and maybe even lower advertising costs. Is this a win-win? It could be…but it might not be a pleasant journey! What do you think about the “Ad” labels? Please share your reactions by leaving a comment! Is this good for all parties involved? How are your ads doing?